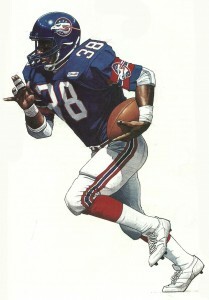 The Ohio Glory were a franchise in the WLAF based out of Columbus, Ohio during the 1992 season. After the 1991 season the league decided to mercifully euthanize the 0-10 Raleigh-Durham Skyhawks. To return the league to a ten team league they decided to place an ‘expansion’ franchise in one of their finalists cities from before their inaugural season. Among the choices were, Mexico City, Milan, Washington DC, and Denver. 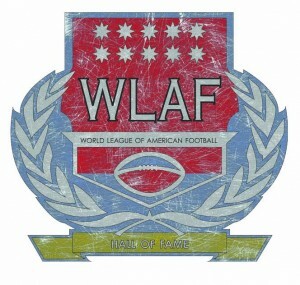 In the end the league decided to bring the WLAF to Columbus, Ohio. As boring as the selection sounded, Columbus was actually a wise choice for a franchise which would play its games on the campus of Ohio State at Ohio Stadium. 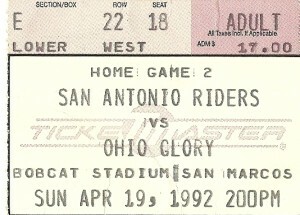 Despite the perception that strong college football programs tended to blight other football franchise attendance, the Glory, had over 30,000 fans show up for games on 3 occasions, including a season high 41,853 to watch the Glory win their only game of the season, – a 20-17 victory over the Frankfurt Galaxy. Unable to find an owner for the team, the league would run the franchise and appoint Peter Hadhazy to run the team. The Ohio Glory’s head coach was former Hall of Fame offensive lineman Larry Little. While other teams had minorities in many executive roles, Little was also the first minority head coach in the league. 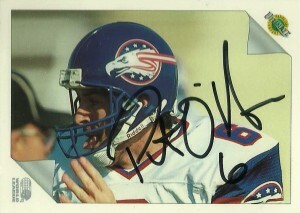 The WLAF would be his first pro head coaching gig, – which he admitted he had been dreaming of doing for years. With his big personality, Little was a very popular coach with the fans and media who swarmed him when he hit the field before games despite the team’s felonious record. As part of the condition of the dispersal of the Skyhawks, – most of the talent from that team was returned to the draft pool, so the Glory in essence started from scratch. Ohio selected former Dallas Cowboys’ quarterback Babe Laufenberg with the second overall pick. The Surge and Glory switched picks on defense so Sacramento gave them Center Curtis Wilson. Notable members of the Glory included: Future AFL Orlando Predator head coach Pat O’Hara, and future Packer and Super Bowl champion, George Koonce. Future CFL and Baltimore Stallions wide receiver, Walter Wilson also made his way courtesy of the NFL’s allocation program through San Diego. Ohio had a few bright spots in their single season in the WLAF as Walter Wilson would dominate the receiving charts finishing first with 65 receptions, and Melvin Patterson made a 99 yard touchdown reception setting a new league record. At runningback Amir Rasul finished 2nd in the league in rushing with 572 yards. Over the course of the season the Glory went through 3 quarterback controversies with Babe Laufenberg, Pat O’Hara, and Greg Frey. Consistency proved to be a major problem for the team on offense, even though Ohio rolled up the statistics- they just couldn’t put it together solidly in one game. In the end, the Glory lost 4 games by a total of 16 points. Surprisingly the defense wasn’t bad, giving up more than 24 points in only 4 contests. Chad Rolen and Charles Jackson led the team in sacks and tackles respectively. Jason Wallace, CB would tie for 5th in the league with 3 interceptions, while Tom Rouen would finish second in the league in punting yard and average, and also set a league record with an 85 yard punt. After the season ended, Charles Jackson was named to the All-World Team along with Wilson and Rouen. The league reorganized after the 1992 season. In 2004, the Arena league Buffalo Destroyers relocated to Columbus, where they’d remain until the AFL also reorganized after 2008. Although not among the retooled teams of the new AFL in 2010, Columbus has had a long and rich history of football through Ohio State. At times the city has been mentioned as a potential destination spot for the UFL and other fledgling leagues, however all of that has remained a rumor, as pro football has escaped the beloved city of Columbus. 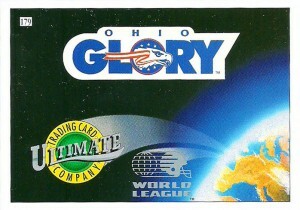 Since the Ohio Glory did not play in 1991, only Ultimate and Wild Card produced sets of the franchise. Ultimate WLAF 1992: , Eric Harmon, Tim James, Jason Wallace. Wild Card WLAF: Darren Willis, Kent Wells, Phil Logan, Chris Cochrane, Eric Harmon, Archie Herring, Tim James, & Babe Laufenberg.